When two wood bison calves were spotted in the Lower Yukon last week the sight was more than just a majestic photo. The calves signaled a promising sign for conservation efforts to reintroduce the wood bison back to Alaska. Photos of the wood bison calf were the first indications that the subspecies of bison, a larger counterpart to its plains bison cousins, was breeding natural in Alaska. When wildlife officials with the Alaska Department of Fish and Game reintroduced the wood bison to Alaska in 2015, the subspecies had not lived in the wild there since 1957. Only a small herd of them still roamed free in northern Canada. It would take a multi-year effort to cross breed the wood bison in captivity with the Canadian herd at the Alaska Wildlife Conservation Center before biologists had 100 bison (50 cows, 20 two-year-olds and 30 calfs) suitable to be reintroduced back into the wild. Getting them to their destination would prove to be another hurdle. Last year, Smithsonian Magazine detailed the journey by Tom Seaton, a state wildlife official who led the herd to its breeding grounds. The journey included retro-fitted steel shipping containers on cargo planes to hoofing it the final five miles across a frozen river. The bulls were transferred later by barge. 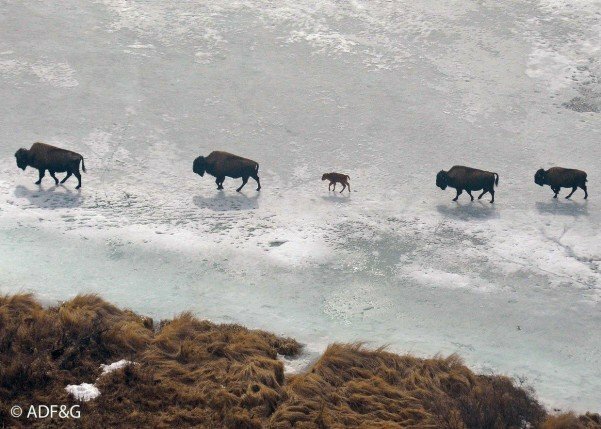 The two calves spotted signaled a milestone event for those involved with the effort that hopefully marks the beginning a viable and growing population of wood bison, according to Alaska Department of Fish and Game officials. At one time more than 150,000 wood bison roamed in Alaska and northern Canada.